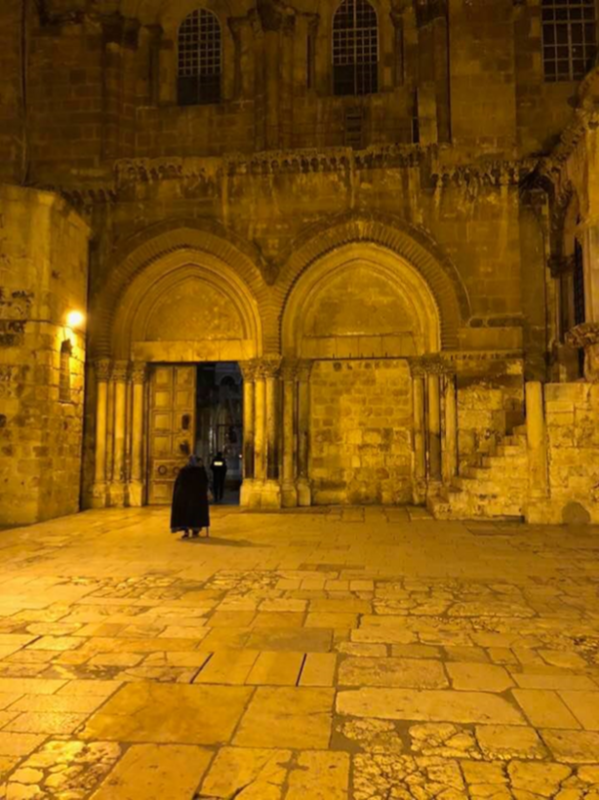 Over the past few weeks, I have been reading the diary of the pilgrim Egeria who travelled to the Holy Land in the late 4th century A.D. in order to worship at places associated with the life and ministry of Jesus. Egeria is one of the few extant female voices of the Early Church and her account of her extensive pilgrimage taken in the 380s gives us a picture of how Holy Week and Easter were observed in Jerusalem only a few decades after the official persecution of Christians ceased within the Roman Empire. Egeria tells us that on Palm Sunday 1,600 years ago, Christian pilgrims were gathering on the Mount of Olives and commemorating Jesus entrance in Jerusalem. They held palm branches, she notes, and “responded continually to Blessed is He who comes in the name of the Lord to the hymns and antiphons.” 1Likewise, the faithful gathered in the Church of the Holy Sepulchre on Good Friday and venerated a portion of what was said to be the cross on which Christ was crucified. Egeria writes, “It is the practice here for all the people to come forth one by one (…) to bow down (…) and kiss the holy wood.” 2And on Easter Sunday, just as we do at St. Thomas, the faithful gathered just before dawn, baptized new Christians, and celebrated Jesus’ Resurrection as the morning’s sun rose. What Egeria tells us is that in Jerusalem, only a few hundred years after the events of Holy Week, Christians had already developed elaborate liturgies that told the story of Jesus that made that same story come alive for the participants. What Egeria participated in is markedly similar to what we do in our small suburban parish in 21st century Ohio. The essence of pilgrimage, and indeed, the liturgy is personal transformation. We at St Thomas, like Egeria, are transformed through our worship. The liturgy of Holy Week – the Triduum of Maundy Thursday, Good Friday, and Easter are a type of sacred drama. We are immersed into the story of Jesus’ passion, death, and resurrection and through acting out that story, it becomes more real to us. We cheer Jesus’ entrance into Jerusalem with loud Hosannas on Palm Sunday and, in the course of the same service, cry out for him to be crucified. We sit with Jesus in the Upper Room and wait with him in the Garden of Gethsemane on Maundy Thursday. 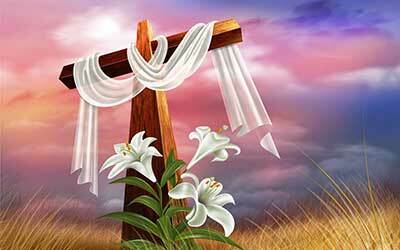 On Good Friday, we witness his passion and death and seeming defeat as we stand at the foot of the cross. 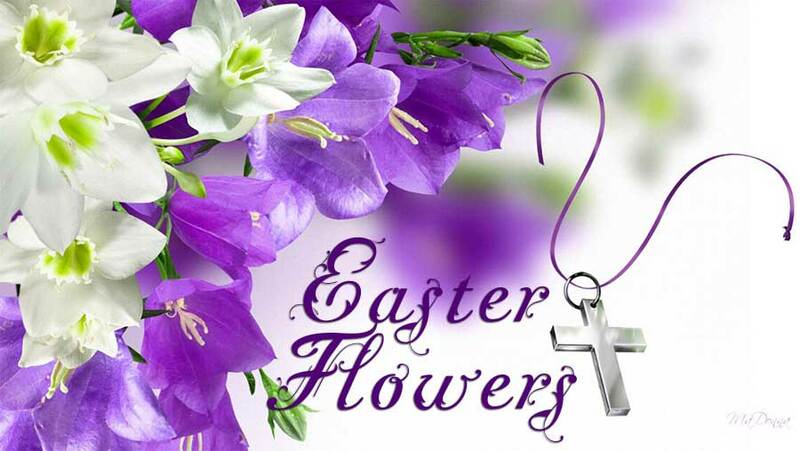 And on Easter, we celebrate that despite that seeming defeat, Jesus has triumphed over sin and death. During Holy Week, we like Egeria, live into the story of Jesus’ death and resurrection. That story is real. Jesus truly died and rose again some 2,000 years ago and because that tomb was found empty, we have been saved. Holy Week is our story because it is the story of our salvation. We don’t remember it as a cultural artifact from a barbarous and more superstitious time, we remember it because what Jesus did then, saves us now. On the Cross Jesus opens wide his arms to us and embraces us with the love only God gives us. Holy Week teaches us that, whoever we are, Christ has redeemed us. And to know that, transforms our lives. 1Gingras, G. and Aetheria. (1978). Egeria. New York, N.Y.: Paulist Press, p.105. Please join us for a soup dinner meeting on Friday, April 12 at St. Matthew’s Episcopal Church in Brecksville at 5:30pm. Following the supper we will be discussing plans for our annual soup supper in October, as well as reviewing new reports about progress in the schools in El Salvador. 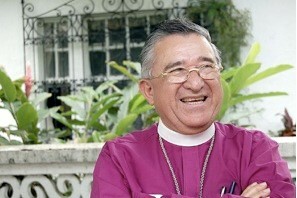 We are all saddened about the deteriorating health of our beloved retired bishop of El Salvador, Bishop Martín Barahona and ask for your prayers. For many years he has been a wonderful friend, and a bulwark in the work of the church in the Diocese of El Salvador, especially in the great progress made by our schools there. Articles for the July/August issue of the Wayfarer are due by May 20, 2019. Please forward articles to the church e-mail address. Readers, Chalice Bearers and Ushers are all needed for our Maundy Thursday, Good Friday, Holy Saturday, and 7 am Easter Day services. Readers and Cross bearers are also needed for the Stations of the Cross. If you plan on attending, please add your name to the sign-up sheet on the office window. Donation envelopes are also available on the office window to help defray the cost of the meal. Donations can be placed in the offering plate or left in “Parish Mailbox” on the office window. Veterans’ Meet and Greet Lunch – The coming lunch will be on Friday, March 29 at 11:00. We welcome all veteran’s and their wives to attend this lunch and program. We will be serving your choice of fish or chicken, french fries, coleslaw, and cupcakes for dessert. The program will be a barbershop quartet, Red Door Four. If you can volunteer, please be at the church by 9:30am. We need your help by signing up to provide cupcakes. Our April lunch will be on Friday, April 26 and the menu will be Rigatoni (with or without meat), salad, garlic bread and Klondike bars. The program will be Chuck Stella and his Service Dog. Please come to these events! LGTB program – Could you join us to participate in the Pride Parade on June 1? More information later. Climate Change – Help us organize a program to address the environmental issues we are all facing. There will be discussion at the coming Outreach Meeting. A donation tub is set out in the hallway, please turn in your donations by April 14. Thank you for your help! You may have noticed the shrubs and perennials that were planted in the Native Plant Garden in 2018. You can see some of them from the church parking lot and others through the east windows in our main sanctuary. If you’re in the right place at the right time, you can see the birds coming to eat the berries and seeds that persisted into the winter. When members of the NPG Committee were working in the garden last summer, people parking their cars in the BW lot told us how much they enjoy seeing birds there for the first time. And it’s about to get better. 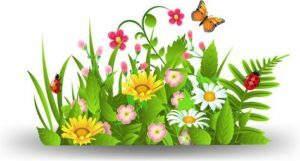 We’ve ordered over 100 new shrubs and perennial seedlings. 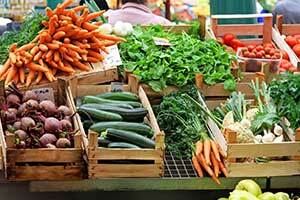 When they’re mature, they will give us a wider variety of seeds and berries in the winter and flowers of many different colors and bloom times. We expect to have something in bloom from April through October. You can be a part of it. Depending on how many volunteers we have, we should be able to get everything planted in one or maybe two days. If you’d like us to call you when the order arrives in late May or early June, please sign up on the sheet on the office window. Contact Marcy Molmen or Jane Boomer if you have questions. 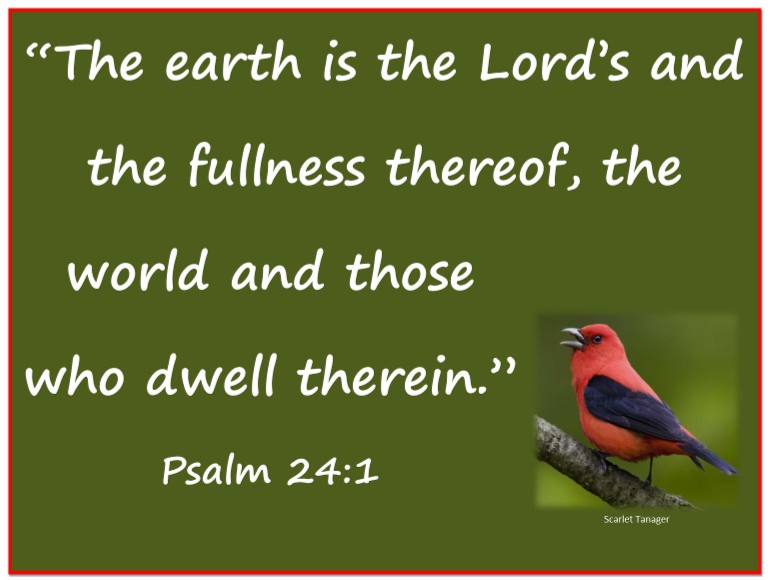 Our faithful members gather together every Monday at 7:00 in the Church Office to study God’s Word, to give praise and glory to God, and to lift up our prayer concerns for the world, our country, our church, our friends, and anyone for whom the Holy Spirit directs us to pray. We recently finished a fascinating study of the first nine chapters of Proverbs, which gave us insights and instructions on how to seek and live by God’s wisdom for our lives. We are now starting a study of the Old Testament prophet Habakkuk. This book gives us great encouragement in the midst of life’s difficulties. We would love to have you join us for our weekly meetings! If you have any prayer requests or questions about the Prayer Group, please email Clint Anderson. It’s amazing the wide varieties of thoughts and viewpoints we always get on questions such as these! Our Socrates Cafe is an official member of a worldwide Socrates Cafe network of more than 600 groups. If you enjoy lively and insightful discussions about philosophy and life, please come and give Socrates Cafe a try, you don’t need to consider yourself a philosopher to be part of Socrates Cafe. Just come and see what you think. We’d love to have you join us! If you have any questions, please email Clint Anderson. 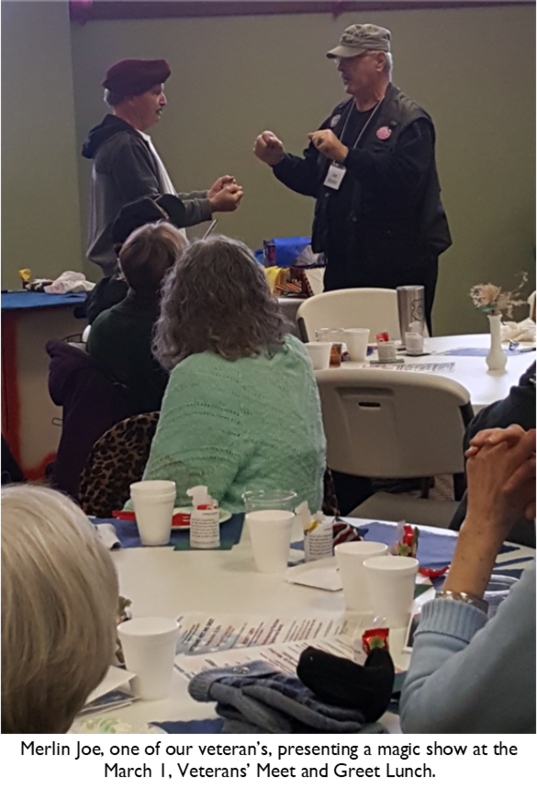 Our monthly lunch and program for veterans has been going for about three years now. It is our way of saying thank you to those who have served our country and to give them support and encouragement. We meet on the last Friday of each month. 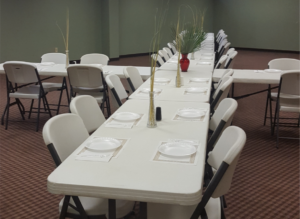 People start coming in any time after 10:00 for a time of open fellowship and sharing, with the lunch beginning at 11:30. Following the lunch, we have a program with various speakers and entertainers. The March 29 meeting featured our own Jan Smith and the Red Door Four barbershop quartet. At the April 26 meeting, dog trainer Chuck Stella and his service dog will be with us. On May 31, the program will feature one of our veterans, Dale Eckert, who will lead us in a patriotic sing-a-long. On June 28, Mary Hopkins of Pleasantview Care Center/Legacy Place Assisted Living, will share about the services available to veterans and families. The Veterans’ Meet & Greet program has grown substantially during its three-year existence. We now regularly have around 60-70 veterans and family members with us each month, along with our volunteers and special guests from various veterans’ groups and services. We have many dedicated volunteers who plan the meetings and do the work to make them happen. Many thanks to all our volunteers! We can always use more volunteers who love our veterans and who would like to express that love and appreciation in concrete ways! Please see Ruth Ihde or Clint Anderson if you would like to help. And please support us with your prayers! St. John’s in Ohio City (2600 Church Ave, Cleveland) will again host the shared Easter Vigil on Saturday, April 20 at 7:30 pm. 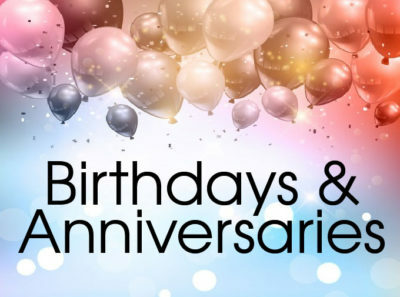 At the conclusion of the service the celebration will continue with fellowship in St. John’s Parish Hall with light snacks, which our own St. Thomas ECW will be providing. We hope that you will join us for this unique opportunity for fellowship and worship. See you there! 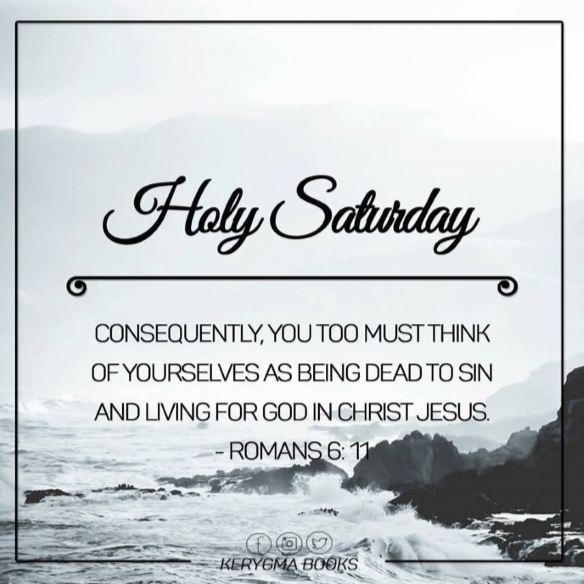 Please remember there will not be a 5:30 pm Contemporary Eucharist at St. Thomas on Holy Saturday, April 20. Do you feel the call to serve? Would you like to help those who are in need? Are you looking for a way to deepen your faith through service to others? If so, please consider joining with other St. Thomas Youth on our annual Mission Trip to Lotts Creek, Kentucky. We work with other churches to help the community and school located in the Appalachian area of Kentucky. On previous trips we have planted gardens, cleaned and painted areas of the school for the next year, helped hang drywall, mend porches, and volunteered at the local food pantry. Can’t attend, but would like to help out in other ways? As we prepare for this year’s trip, we are also in need of your financial support. Your donation helps defray the travel cost for each young person that attends. To make a monetary contribution, please make your check payable to St. Thomas, and indicate “Lotts Creek” in the memo line or on the outside of your envelope. If you would like more information about becoming a part of our Youth Mission Trip, please speak to Bart Hancock or Alyse Hancock-Philipps. 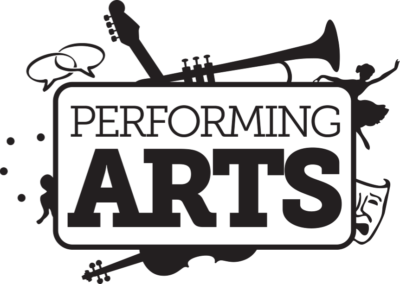 A grant through the Episcopal Diocese of Ohio has given us some money to do a Fine and Performing Arts program with young folks this summer, and I am hoping for your help and expertise. I have noticed over the course of my time at St. Thomas that each of you have great hobbies, jobs, interests, skills, and out-right blessings that are contained in what you do and who you are. On June 10th – 14th, at St. Thomas Church, we are hosting 5 days of Discovery, 8:00-4:30 pm, for kids grades 4th through 8th from our own church, and from all over our Berea/Middleburg Heights/Brook Park area. I am asking you to dream a little about what you love doing, and think of ways you might present your hobby, secret love, interests, and learning to this age group, either in a one-time shot workshop for an hour, a daily short lesson, small group stuff, big group fun, individual one-on-one fun, whatever you think would work for you to pass on your gifts to young people. I am thinking of things like simple sewing projects, gardening, a Nature walk, small group piano lessons, (we have been gifted four keyboards by Tri-C), guitar, (we have several we can use) some Hip-Hop dance, storytelling, a writing workshop, group class voice, some crafts and arts – you name it, we can do this. We are exploring some partnerships with other churches and the Berea City Schools, and hope to accept 20-40 kids, as well as our own flock. Please let me know if you would like to share yourself and your interests/passions with young people during this week in June. If you have never done something like this before, we can share our experiences with working with youngsters of this age in the camps and the youth programs that our staff have done for the past decades. What do you think? E-mail, call, talk after church, however you would like to communicate. Join Team Etta or Team Anita as we clean up the inside and outside of the church. We will assign duties according to your ability so please don’t feel that you can’t be a part of this opportunity to grow in communion as a parish. 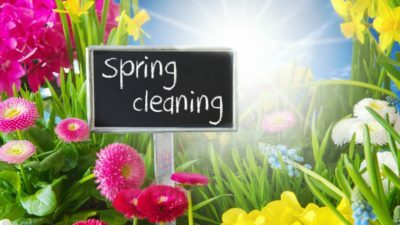 We don’t have enough equipment so please bring items you may have for cleaning or yard work: gloves, weed trimmer, shovel, bucket, rake, pruners, broom, rags and a positive attitude. A light lunch will be provided for all volunteers!